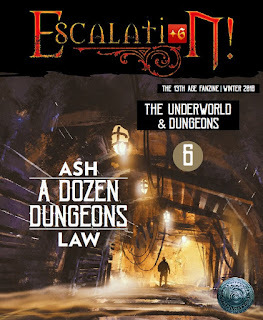 I'm pleased to announce that Escalation Issue 6 is now available! This issue's theme is The Underworld and Dungeons. Inside, you'll find numerous dungeons, ranging from the traditional to the gonzo. We also offer some new options for both GMs and players, including icon-themed one-use items, the Warrior class, new racial options, and living spellbooks. It's free, so take a moment to download it and give it a read. Another Escalalation is always a good thing, but this Underdark/Dungeons stuff is probably going to be helpful to people who don't even play 13th Age. I'm going to see if I can raid any of your ideas for use on Reorx. Awesome! While there are some "crunch" articles in the issue, the adventure, location descriptions, and magic item descriptions are all good options for games played using other systems.